INFORMS Editor’s Cut is a comprehensive online multimedia portal designed to enrich the knowledge base of those interested in analytics and operations research applied across a variety of topics. The inaugural Editor’s Cut volume “Healthcare in the Age of Analytics” examines the impact of analytics in all areas of healthcare from operations improvement to public policy guidance. Click here for open access to the volume. After reviewing Editor’s Cut, take a quick survey and be entered in a drawing to win an Apple Watch. You must be present at INFORMS Healthcare 2015 to win. This third INFORMS topical conference on healthcare focuses on reinventing value in an era of health reform, specifically the use of O.R. and analytics to improve the long term efficiency, effectiveness, and quality of healthcare delivery. The conference includes elements of both an INFORMS academic meeting and practitioner-oriented meeting. Joint involvement of Vanderbilt’s medical and business schools provides a unique conference experience for the attendees. Hear more than 450 talks and perspectives on relevant topics that span academia and business processes and applications. Get valuable insights that will help decision makers better understand the value of analytics as a competitive driver. Enjoy extensive, organized, and facilitated networking opportunities that provide future directions and contacts that can help you today. Meet with research vendors and suppliers. Take advantage of technical workshops that provide software solutions explained in the context of healthcare. Share real-world lessons with your students who will want to know how to apply O.R. to healthcare applications. The best, most dynamic current research in healthcare O.R. and analytics presented in one, highly focused conference. Synergism of business and management principles with medical principles provide a unique learning experience. Multidisciplinary research providing a 360 degree view on analytics, O.R., information systems, statistics, epidemiology, and more. A cross-cultural view of healthcare systems and operational impact from around the world is assured by an international panel of experts from U.S., Canada, and Europe. An intimate, small-scale setting to drive learning. 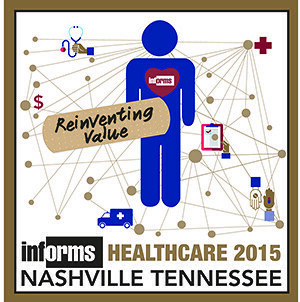 INFORMS Healthcare 2015 focuses on reinventing value in an era of health reform, specifically the use of O.R. and analytics to improve the long term efficiency, effectiveness, and quality of healthcare delivery. We welcome submissions in either oral or poster formats, which will be reviewed by the committee. There is a limit of one oral presentation per presenting/lead author. Authors may present a poster as well as one oral presentation.